An exquisite, handcrafted Venetian mirror replicating the classical hand-made Venetian mirrors of the early 1900's. The center reflecting surface is a true mirror of Murano glass (oval shape 13 inches X 16 inches). 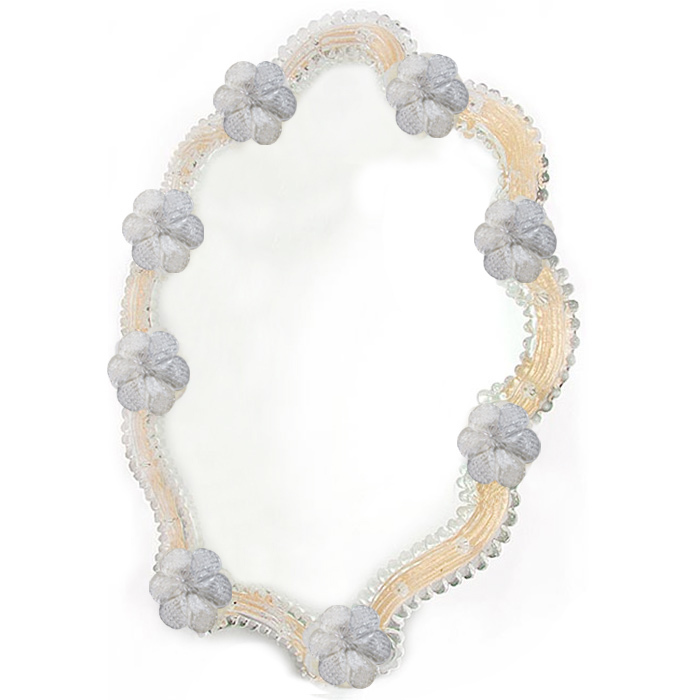 Made in the fashion and techniques of traditional Venetian glass mirrors, this piece features a border of crystal glass ribbon curves accented with Clear flowers on a dark stained wood backing. The basic construction maintains the techniques from the 1900's of attaching the glass pieces to the mounting frame using glass studded nails. Outside mirror dimensions are approximately 18 inches in height and 15 inches in width. Mirror is handmade in Murano, Venezia, Italia. * Comes complete with leg stand for table top display or hook for wall mounting.